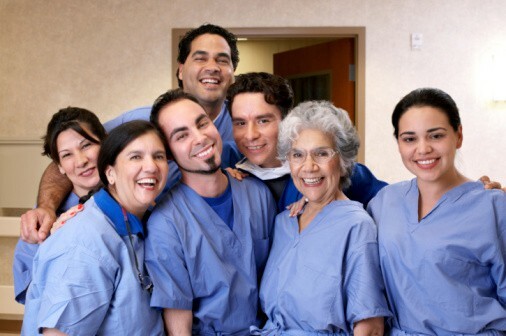 Home Ambulatory Surgery Centers 7 Easy, low-cost ways to let your team know you value them! 7 Easy, low-cost ways to let your team know you value them! It’s never been more vital to retain your experienced nurses. In just the same fashion as they came, Baby Boomer nurses are leaving the workforce in droves. About one-fourth of all nurses over the age of 54 plan to retire within a year, according to estimates. From someone who recruits nurses for surgical centers and hospitals, here are 7 simple ways to make your nurses feel more appreciated — and maybe make them forget about retiring for a while. 1) Say thank you … publicly. Everyone loves to be recognized, especially in front of his or her peers. A private thank you is nice, but a group email or a shout-out in a staff meeting packs more of a punch. 2) Order personalized mugs. Buy everyone a monogrammed coffee mug with their initials on it, so every time they take a sip, they think of you. With printing sites all over the web, giving a gift like this one is easier than ever. 3) Hold a “nurse-of-the-month” contest. Having an award to vote on every month is a great way to strengthen the bonds of your nurses and keep them focused on the positive aspects of patient care. Ask everyone to submit an anonymous ballot with a written explanation to back up their votes. At the end of the month, announce the winner and read why her peers voted for her. 4) Cater a meal. Buying lunch for the staff every now and then can go a long way. Ordering trays of food and sandwiches are a great way to demonstrate that you notice their hard work. Plus, who doesn’t love a free meal? 5) Host quarterly, off-site meetings. Take the time to take your staff away from the Operating Room and meet as peers and friends. Use outside environments to establish stronger bonds between coworkers and help them relax around their bosses and supervisors. Activities like hiking or rock climbing make for great teambuilding exercises, and it’s a fun way to let everyone level with each other without the added pressure of being at work. 6) Sponsor family events. Open up the invite to friends and family of your staff and host fun events outside of work, like bowling parties or picnics. These events can even be tied to the quarterly, off-site meetings, as long as you set aside time for team bonding before friends and family come and join the party. 7) Give the gift of a gift card. Not only are you going out of your way to say thank you with a personalized gift card, but you’re also personalizing the gift to show that you know what your nurses enjoy doing outside of work. Some might enjoy a card to their favorite coffee shop. Some might love going to the movies. Whatever it is, listen to your team and make the gift something a little more personal to them. Is Working with a Recruiter Really Worth It? 75% of American’s are living paycheck to paycheck? Is Transparency in Leadership a Good Idea? Is Your Resume Due for a Make-Over? Top 5 Best Business Lessons according to Warren Buffett! Is Thursday the New Friday?